To fell or not to fell? 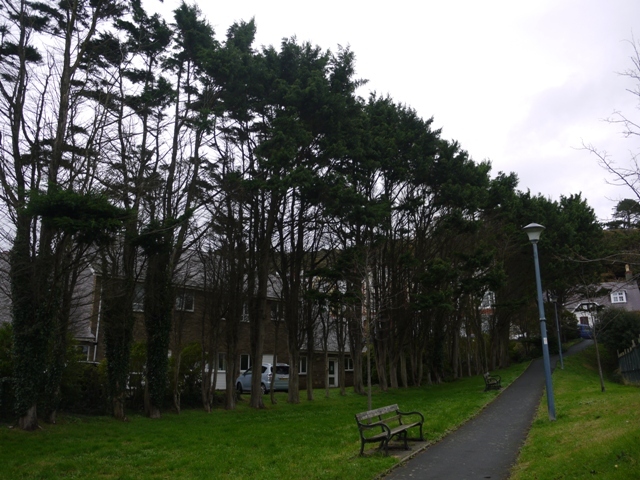 There is a good deal of consternation around the Council’s decision to fell trees on Cambridge Terrace so I went between the rain showers to investigate this quiet corner of Aberystwyth. It is not a road but a footpath really, which sets off along the back of the houses on Queen’s Road, just after the dejected former catholic church, and runs along below the bowling greens as far as the North Road Clinic. 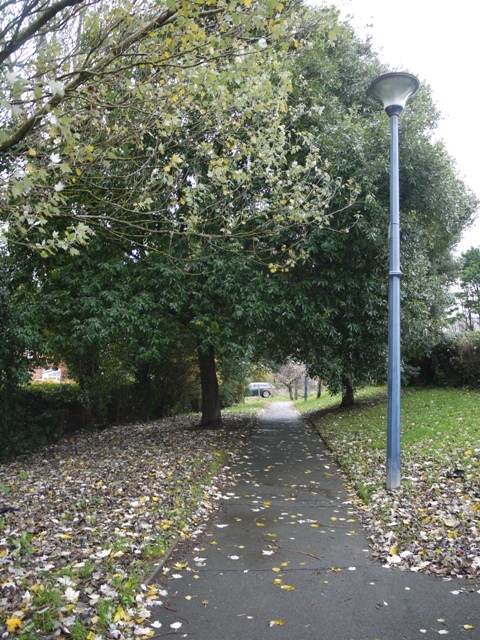 Here the path swerves uphill to approach North Road. The specifications sounded alarming: 33 Monterey Cypresses and 5 White Poplars are for the chop, and I have heard parallels being drawn with the disgraceful sacrifice of street trees which has caused so much anguish in Sheffield. So I was relieved to find that the 33 Monterey Cypresses are basically just an outgrown hedge. These are not trees which like being crowded, and which when used as a hedge must be cut meticulously every year because unlike Yew they do not sprout again from old wood. The hedge has obviously escaped the council’s care many years ago, and the result is spindly misshapen trees, which have very little visual appeal. I think their loss is justified. Far fewer trees widely spaced could be allowed to reach the same height here but they would be far more shapely. 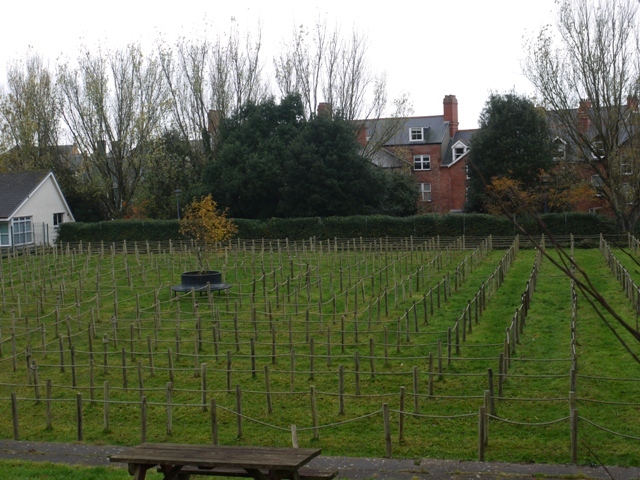 The poplars form a twiggy skyline when seen from North Road over the rope maze, and I understand at least one resident has objected to their invasive roots affecting his garden. View from North Road, the poplars reach above the Holm Oaks on Cambridge Terrace. But when I walked along this pretty path behind Queens Road I was struck by the other planting here. There are a couple of gnarled and contorted Wych Elms ( Ulmus scabra ‘Camperdownii’) , and some small crab apple trees, but the secluded character of this byway is defined by the many substantial Holm oaks on either side. 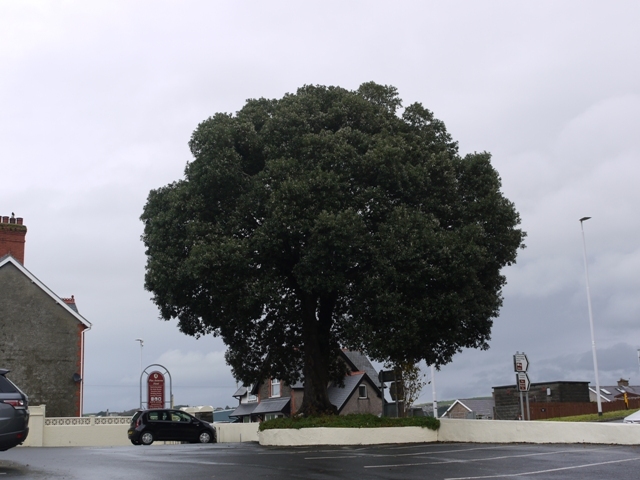 This evergreen oak is a delightful town tree, most appropriate for a Victorian setting, and I am relieved to see that these will all be retained. Already the poplars are overshadowing and their branches inter-meshing with the Holm oaks. Irrespective of the root issue, this is just too many trees in a confined space, so I cannot oppose their loss. In considering the suitability of the Holm Oak I am reminded of the landmark tree outside Plas Antaron which marks the entry to Penparcau. This is the same tree that stood there in the 1860s and appears in a sketch in one of W.T.R. Powell of Nanteos’ famous scrap books, and records his and his friends’ drunken return there one evening. About 15 years ago I remember that tree surgeons lopped off its spreading crown, first on the road side one year, and once this re-sprouted, on the other side two years later. It looked pretty brutal at the time but the crown re- grew to create the handsome bushy tree we see today. The Cambridge Terrace Holm Oaks have the same potential, and already screen the houses from sight from North Road. They will flourish without the crowded competition and are a well mannered tree well suited to this location. Hedgehogs have been seen on Cambridge Terrace and probably thrive there not just on the insects and earthworms but on the nutritious fallen acorns from these trees. If and when the somewhat dreary rope maze is replaced by a more conspicuous or noisy recreational facility there will still be this calm canopy of dark green forming a backdrop to the former second bowling green.